Launched earlier this month in the pages of the weekly 2000 AD anthology, "Sláine: The Book of Scars" is an all-new serial celebrating the 30th anniversary of writer Pat Mills' Celtic myth-inspired barbarian fantasy hero whose adventures have made stars of some Britain's best comics artists including Mike McMahon, Glenn Fabry and Simon Bisley. All three are returning to the pages of 2000 AD for a special story by Mills that finds the warrior at the height of his power, which of course means it's time for Sláine to be brought low. In this case, by an otherworldly enemy who conspires with Sláine's greatest foes to send him back through time to be defeated and thus undo his fearsome legend. Illustrated by multimedia artist Clint Langley, chapters one and two of "The Book of Scars" are on sale now in 2000 AD "progs" (issues, basically) #1844-1845. 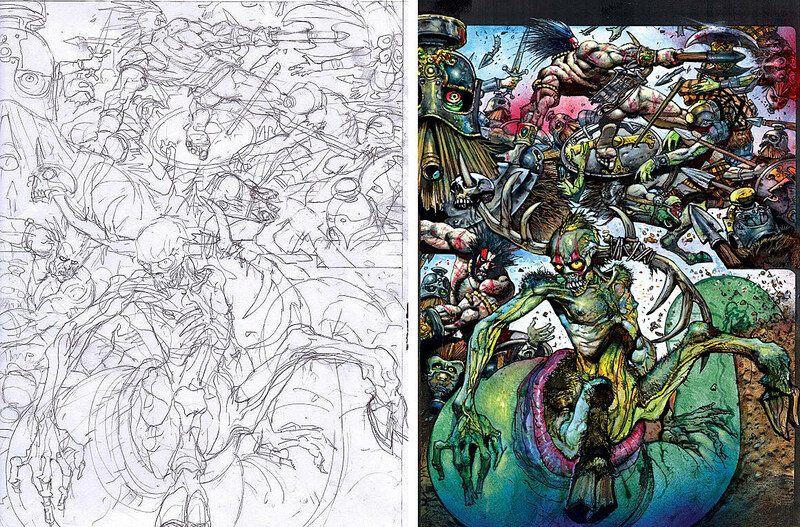 Coming up before too long will be an installment by the great Simon Bisley, whose rough pencils we're happy to publish here alongside the fully colored work. The transition from Bisley's almost comically sketchy pencils to the fully rendered, hyper-colored paintings reminds me of a recent Batwoman process post by JH Williams III. Both artists seem to leap from a seemingly simple, even crude guideline to wholly realized works that are occasionally masterpieces of action and mood. 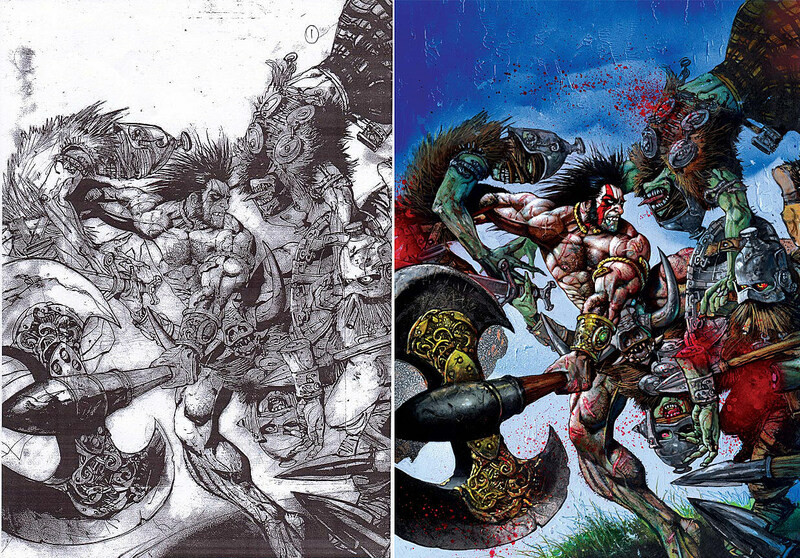 It's also remarkable how well Bisley's style -- which I know best from his classic work on the largely comedic Lobo -- compliments the melodramatic, almost overwrought narrative of Sláine. But it was indeed this kind of stuff in Sláine: The Horned God that made Bisley a name in the UK, and why it's such a treat for longtime Sláine fans that he's returning to pay his respects to the Celtic king. "Sláine: The Book of Scars" part one is available now in 2000 AD prog 1844, which US and international customers can buy digitally (DRM-free) on the web or via the 2000 AD app. Part two is available the same way. Bisley, Fabry and McMahon's stuff will be coming up in future chapters, all of which will be collected in a hardcover volume going on sale in November.